This article is a sequel to my previous article, “10 Inspiring Picture Quotes Of Late Nelson Rolihlahla Mandela“. Recently, a sudden attention has been drawn to the demise of the exemplary leader who unlike his mates, fought for a worthy cause till his dying days. 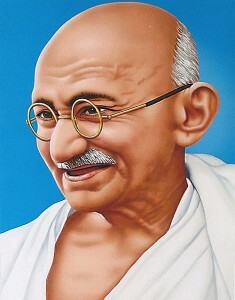 I have decided to stay within that context & bring to light another inspirational leader, Mahatma Gandhi. Mahatma Gandhi’s gentle approach to life is testament to the fact that strength does not equal physical capacity. In my country Nigeria, we were taught to be tough, vehemently seeking for the necessities of life without looking back to assist the other fellow. This is primarily the cause of the high spate of corruption which has arguably eaten deep into the bone marrows of everyone, even the unborn child. So sad! This wise leaders life story has proven that it is possible to remain gentle in spirit yet simultaneously command a huge amount of strength, respect & propagate change. In a crucial moment like this in our nations nascent democracy, we would only pray for peace, unity & love. The only way this philosophy can be embraced is when we affect our immediate circle. Let us quit blaming our leaders for our woes & embrace change right there where we sit reading this article.Charity begins at home,they say! I hope you can take some time to soak up the invaluable wisdom from the 15 Gandhi quotes below, and decide for yourself how you will exude your own gentle strength today, & be the CHANGE everyone has been praying for! #FemaleFounderFriday: Meet the Amazing founder of CookedbyTee, a company that integrates corporate catering and food management.